Cats can be great pets — they’re some of the most self-sufficient pets you can possibly have. They take care of their own bathroom needs. They’re confident enough to be left alone for a couple days if you need to take a weekend business trip (though someone should check in on them every day or so). They can even bathe themselves with their teeth and sandpaper-like tongue. Sometimes, however, they get into something incredibly sticky or stinky, and they need some help. But bathing a cat, if you’re not careful, can be a nightmare of claws and teeth! 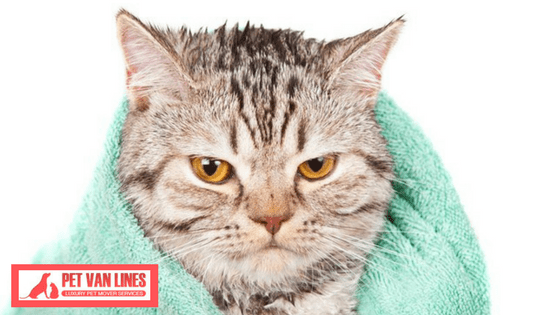 Discover some professional cat bathing tips, and learn how to safely give your kitty a bath so they always stay affectionate, clean, happy and healthy. The first and most important cat bathing tips involve timing. Make sure you get the bath done when the cat is mellowed out. When they’re laying down for their daily nap is an outstanding time. Make sure your kitty’s claws have been freshly trimmed. This will limit the number of scratches you suffer in the process of bathing them. Give them a good once-over with their favorite pet brush to get matting out and remove loose fur (there might be a lot of it). It’ll help to keep the drain clear. Also, consider putting some cotton in their ears to keep water out. Stability is important to cats. Place a rubber mat in the sink or bathtub so their paws don’t slip around. This will help to keep them calm(er) in the tub. Use just 3 to 4 inches of lukewarm water. Don’t use hot water; your kitty is very sensitive to this! Using a handheld spray hose like you would for dishes is a good bet to wet them down. Don’t spray into their ears, nose or eyes. If you don’t have a hose, use a plastic cup or pitcher. Get a good cat shampoo — human cleaners can dry out their skin and cause problems. Mix it one part shampoo to five parts water, and work from head to tail, with the hair growth. Avoid their face and ears. When finished, thoroughly rinse them with your pitcher or hose. Make sure they’re completely rinsed out. After this, use a washcloth and plain water to wipe down their face. If it’s extra sticky or grimy, use a solution of shampoo that’s extra-diluted shampoo. Again, be careful around the eyes and ears, and rinse well. Wrap your kitty in a large, fluffy towel and keep them in a warm place while you pat them dry. If they’re okay with the noise, a low-setting blow drier can work, but otherwise just pat dry. Also, be sure to run a brush or wide-tooth comb through their hair. Pets need affection, attention and approval. Give them lots of praise and tell them how good they did. It may make them more amenable to future baths. Pet Van Lines has years of experience taking care of all kinds of pets, moving them from home to home. If you need help getting your kitty to their new forever home, give us a call for help today!